Fantasy novels are known for their incredible detail and fantastic settings. From Middle Earth to Westros, stories often live or die depending on where they’re set. Martha Wells, who’s recently released the latest installment of her Raksura series, outlines how she builds her own worlds. 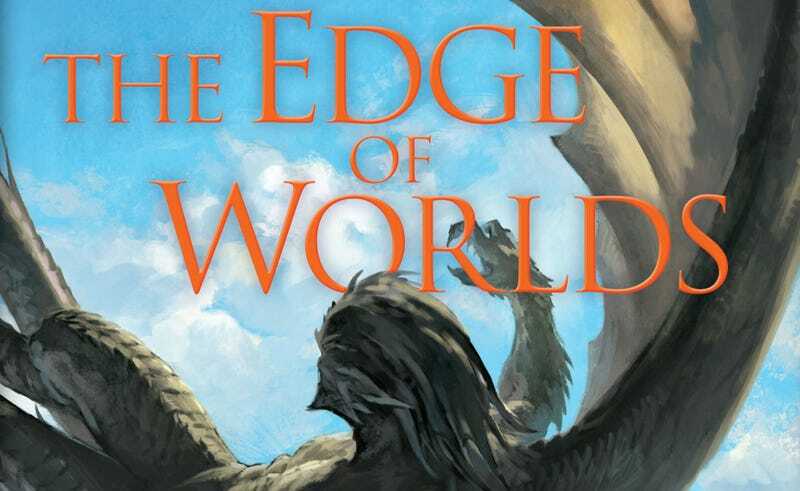 Her latest novel, The Edge of Worlds, recently came out in stores, and picks up her Books of Raksura series several years after she published the last novel in 2012. We recently chatted with her about worldbuilding and learning as you go. Your latest book, The Edge of Worlds picks up in your Books of the Raksura series, the first three of which were published in 2011/2012. Why pick up the series again after four years? Actually there have been two other books that are part of the series, a two volume set of novella and story collections. Stories of the Raksura I: The Falling World & The Tale of Indigo and Cloud, which came out in 2014, and Stories of the Raksura II: The Dead City & The Dark World Below, which came out in 2015. I kept going with the series because I’m still having a lot of fun with the world. I love writing about my matriarchal bisexual polyamorous flying lizard-lion-bee people, and I’ve had encouraging words from a lot of readers who wanted to see more stories about them. There were elements of the world that I had in mind since I started the first book that I hadn’t had a chance to explore yet, and I wanted to take the opportunity to take the story to the conclusion I originally had in mind for it. You mentioned in an interview that this was a book that you had long wanted to write in the series, but it took a couple of other books to figure out how to write it. What did you learn from the other books you’ve written that you are working to apply here? It wasn’t so much a learning experience, as it was figuring out how to take the story where I wanted it to go. The first three books are about the main character, Moon, who had lived for years in isolation, coping with finally finding his people. He has to learn to trust his new, large, dysfunctional family, understand his place in a complicated culture, and deal with the fact that he’s a consort, one of the only male Raksura capable of breeding with the queens. It’s a politically fraught position in a matriarchal society, and difficult for someone who has been a loner for almost all their life. At the end of The Siren Depths, the characters were settled down in their ancestral home in the Reaches. So I had to come up with a compelling reason for them to leave, and also figure out how to take the story to the places where I wanted it to go. What have you learned about writing and world building from the time you started this series, to the final book? Is there anything that you’ve found will be informing your next novel? I think I’ve learned more about thinking outside the box when it comes to world building, and pushing my imagination as far as it can go. Your books have frequently received praise for your world building, and I noticed that you had studied anthropology in college: how has that figured into your writing? What’s most important when creating a new world? I think that when I was trying to create imaginary worlds, it helped me to know how the real world works. Even if I was going to have a world with so much magic that physics and biology are affected and changed by it. Studying how real-world cities worked at various times in history, and how cultures and religions change over time, and the kind of technologies that cities in the ancient world developed, and how different cultures interacted with each other, all helped fuel my imagination and let me create my own cultures and cities. Are there any particular cultures or religions that you’ve been drawn to when it comes to building new worlds? Who do you reconcile the lessons of modern cities and society and utilize them in a fantasy world? I don’t think I’m drawn to any particular culture. I love looking at places like Mohenjo-daro or medieval Benin City, for example, with interesting infrastructure. One of the things I’m working on right now is a fantasy city using a lot of magical technology and figuring out how they would use it for things like mass transportation. There are a lot of strange and forbidding places in the series, but it’s also fun to come up with environments that people would actually like to live in. What do you have coming up for the Raksura series? The next book, and the final novel in the series as far as I know at this point, is The Harbors of the Sun. It’s about three weeks from being finished and turned in to the publisher, and should be coming out next year. I do have a Raksura Patreon, where I post flash fiction for the patrons set in between the novels and stories. I’ve also got a short story set in the Three Worlds but with different characters, which will be coming out in the kickstarter anthology Mech: Age of Steel. I also hope to maybe do some more short stories or novellas eventually, but I don’t have anything else in the series that I’m working on right now. The Edge of Worlds is now available from Nightshade Books.